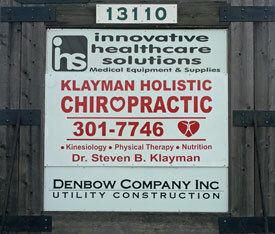 Welcome to Klayman Holistic Chiropractic Clinic! We’re 5 miles west of the Y in Oak Hill. Our office is on the north side of Hwy 290 between Oak Hill and Dripping Springs. We are .9 miles west of Nutty Brown Cafe and opposite of the Belterra subdivision. From Mopac: Take 290 West. At the Y in Oak Hill, bear left onto Hwy 290 (you will pass Austin Community College) for 5 miles. We are on the right hand side. From Lakeway/RR 620: Take 71 to Oak Hill. Head west on Hwy 290 towards Dripping Springs (you will pass Austin Community College). We’re 5 miles down Hwy 290 on the right hand side. From Dripping Springs: Take Hwy 290 East. We’re opposite the Belterra subdivision.From Circle C: Take 1826 South. Turn right onto Nutty Brown Rd. Turn left onto Hwy 290. We are .9 miles west of Nutty Brown Cafe and opposite of the Belterra subdivision.